Make it a habit to clean the kitchen sink every day. The kitchen sink should be one of the cleanest places at our home. By just rinsing out it doesn’t make it clean and free from germs and bacteria. 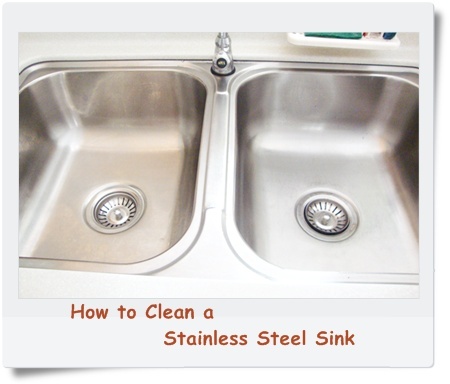 Here I gathered few tips for cleaning a Stainless Steel Sink. For everyday cleaning of stainless steel sinks, use a soft washcloth or nonabrasive sponge with a cleaner. 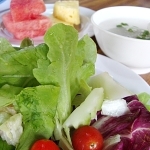 -Wash and remove any dishes inside the sink. -Pour a small amount of cleaner to the sponge. -Wipe the sink in the direction of the polish marks in the sink. 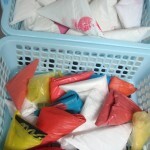 -Using a clean towel or cloth, dry the sink everywhere. – Make sure to dry the sink completely using the cloth. Instead of expensive cleaners, there are plenty of inexpensive natural alternatives to use as a sink cleaner. 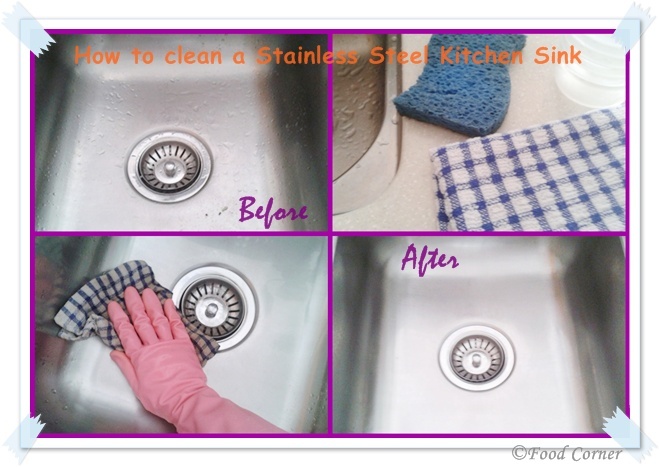 Vinegar & Baking Soda is excellent match to clean a Stainless Steel Sink. First mix lime juice (few drops ) and baking soda and make it into a paste. Use this mix on the wet kitchen sink. Using a soft cloth or non-abrasive sponge, wipe the sink and wash away. Vinegar is an excellent cleaner and it gives a shiny look to the sink. After cleaning the sink, pour some vinegar on a damp cloth or sponge. Then clean the sink as above. If there are any dark stain/spots, use a paste of cream of tartar and lime on it. Add few drops of lime juice on cream of Tartar & make a paste. Use it on the tough stain and rub it. 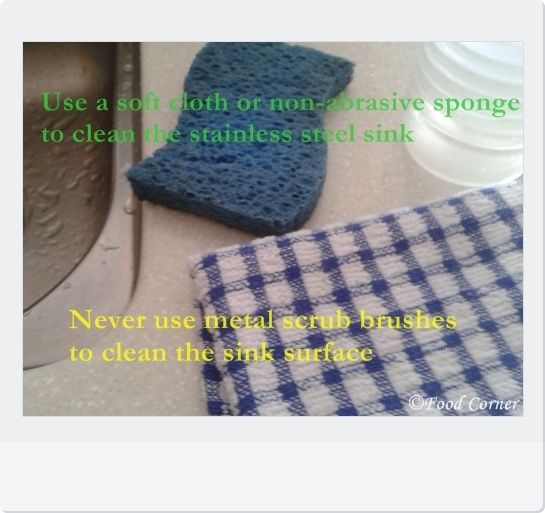 -Never use metal scrub brushes to clean the sink surface. 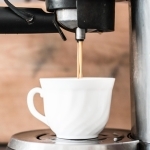 These can seriously damage the sink and leave scratches and marks on the metal. 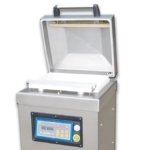 Instead, use a soft cloth or non-abrasive sponge to clean stainless steel. -Don’t leave wet sponges or cloths to sit on the edge of the sink. Use a separate container or plate to keep them, so that the wet material isn’t resting on the steel. This will avoid any rust developing on the sink surface. Do you have any other tips and methods on cleaning a kitchen sink easily?Please share them in comment box with us…. How to fix too much salt? nice post dear..useful post. So, how are ur days going ? TC. Feel free to pop in to my space too when you get the time. Just jotted some tips on”sane motherhood” on my “pick quicks” blog. 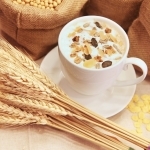 Lets staty connected beyond the kitchen as well…Hope you will be a follower there as well. Very informative and useful post Amy. Thanks for sharing. This is a very useful post, thanks for sharing..
Amy, it is such an useful and necessary information. Thanks a lot for taking time and sharing the same!! Much appreciated! I am happy to hear such a nice comment…. Thank you for stopping by my blog. I clean my sink, but still have stains/spots. Will try vinegar. Thanks! Thanks for sharing this… I usually use vinegar and baking soda. But if am very tired then its the quick fix expensive cleaning method! yes,artificial cleaners are easier to use. Thanks for sharing such a beautiful idea on cleaning kitchen sink without spending much money on cleaning products Amy. I did’t have lime so I used lemon juice. It still worked (and smelled) like a dream. Thanks for the post. I didn’t have lime juice so I used lemon. It worked fine and worked (and smelled) great. Thanks for the post. Very helpful tips! Thanks for sharing and for linking up to Throwback Thursday! I love a sparkling stainless sink! Especially when I enter my kitchen in the morning. Great tips!! I love it when my sink shines. Thanks for sharing your tips on Throwback Thursday. Thanks for this article,its very useful.so thanks.